Regular readers may recall that I recently tried the custom styled Triumph Adventurer, and while I liked the engineering, I had reservations about the bike's usefulness in the Scottish climate. Andrew Wintun, the proprietor of Two Wheels, Edinburgh's agents for Triumph, was anxious that I should try something more suitable and volunteered one of the newly re-styled Trophy tourers. To test a tourer you need a tour, and as some friends from England were stopping over with me en route to a holiday in Skye, it was too good an opportunity to miss. I booked a single room with them at the Uig Hotel, and planned a swift overnight trip. 48 hours and 500 miles later, let me tell you that I am impressed, but it was a trip of mixed fortunes. The Trophy has been around for a few years now in either 900cc or 1200cc configurations, but the early bikes were a fairly nondescript sports-tourer, competent but hardly radical. Triumph have kept the basic engine and chassis, but have changed its focus by giving it a large distinctive fairing with integrated panniers, to compete head-on with Honda and BMW. You can make your own minds up about the looks, but the bike constantly drew attention and most of it was complimentary. What is beyond doubt though is the effectiveness of all that swoopy plastic, it cleaves the air with commendable ease, and makes for a comfortable and relaxed long distance machine. Relaxed that is once you are under steam, as this is a big heavy bike with a high centre of gravity, and to be honest it is a bit of a handful at walking pace, and you need to be Superman to put it on the centre stand with any regularity. 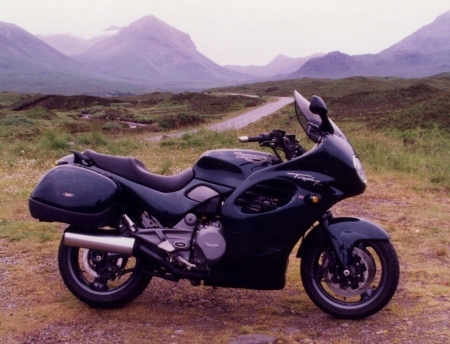 None of this matters when you hit the open road though, and following my friends in their Toyota MR2 and hopped-up Porsche 911 across Scotland in the summer sunshine I was really enjoying the bike. The 900cc engine is good for 98bhp, which it delivers with a growl and no hint of a power band, just a continuous stream of torque and power. On the major roads with light traffic it felt like piloting a low-flying aircraft. As we delved further into tourist territory and the campervans got thicker on the ground, a bit more nip and tuck was needed, and here the bike started to show its shortcomings. The golden rule of superbikes used to be "though shall brake only in a straight line". The latest crop of machines from Germany and Japan can flout that rule and will enter bends under braking with confidence. I rapidly learned that the words "brakes, bends and Triumph" do not belong in the same sentence. This is made all the worse as the seamless rush from the engine and the calm behind that big round fairing make it all too easy to arrive at the next bend a lot faster than you intended. Grab a handful of front brake and the bike pitches forward on its softish front suspension, enter the corner like this the big Trophy will understeer and run wide. Let off the brakes a little too swiftly and you suddenly have a 220kg pogo-stick on your hands, and by the application of Sod's first law of travel, this is inevitably the precise moment that an enormous German tour bus appears out of nowhere looming straight at you. Not funny. Let's be clear about this. I like bikes, and this bike would humiliate my companion's 911 in a straight line, but on this sort of journey four fat tyres on a well sorted sports car gives a measure of safety beyond a big touring bike, at least in my hands. I let them go, as we had agreed re-grouping points en route, and settled into a more composed touring gait. Immediately the bike felt great again, and I had learned an important lesson. Respect your own abilities and those of the machine, others may wish to travel slower or faster, let them. On the return leg, travelling alone, I let the bike decide its own pace, and I had a memorable run. I had a couple of reasons for wanting to go back to Skye, firstly was the hope that I might actually see it, and to my amazement I managed to spend overnight there without it raining. I even managed to get a view of the Cuillins. My second reason was that I had yet to sample the new bridge. I think it an elegant structure, and the steep rise and fall of its arch makes you feel you have landed on the island. It may not be the romance of the ferry, but it does lend a certain drama. But 2:60 each way on a bike is an outrage, and had it not been for the fact that it was not my bike I would have bought one of the SKAT plaques that are in all the shops for the return journey (it stands for SKye Against Tolls). The other irritation is the sheer hassle of fishing for money when kitted up in leathers, gloves, etc. (Oh and probably waterproofs too as this is Skye!). The Forth and Tay bridges long ago abandoned tolls for bikers for this very reason. I was however grateful to reach the Hotel, but rather than the bath and relaxing evening I had in mind, my poor wife was on the phone with the news that our hot water cylinder had burst and flooded the house. I spent a large part of my evening trying to offer DIY plumbing advice to a harassed bucket-weilding spouse. Sod's second law of travel perhaps. As ever the bike was a conversation starter, and I ended my evening over a few beers with Chris the waiter who had just ridden his Suzuki 500 up to Skye for the season. In the rain of course! So what of Triumph's attempt at a serious touring bike? A few years ago this bike would have been state of the art, but progress is relentless and in certain areas the bike is outclassed. It does not have the sheer refinement and superb brakes of the Honda Pan European, nor does it have the clever suspension of the latest BMWs. Nor does it have fuel injection, ABS, or other current complexities. To many people this simplicity will be its strongest suit, as Triumph have stuck with tried and tested designs for one very good reason. And that reason is cost. At just over 9,000 on the road, the Trophy 900 is thousands cheaper than any of its rivals, and that is a compelling reason to live with its few foibles. Just remember to brake in a straight line though!